12 cell jiffy propagator with a packet of Agastache Liquorice Blue seed includes expanding jiffy pellets. 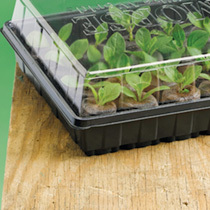 12 cell jiffy propagator with a packet of Aster Milady seed includes expanding jiffy pellets. 12 cell jiffy propagator with a packet of Aubergine Bonica seed includes expanding jiffy pellets. 12 cell jiffy propagator with a packet of Brussels Sprout Maximus seed includes expanding jiffy pellets. 12 cell jiffy propagator with a packet of Cosmos Sea Shells seed includes expanding jiffy pellets. 12 cell jiffy propagator with a packet of Courgette Ambassador seed includes expanding jiffy pellets. 12 cell jiffy propagator with a packet of Cucumber Telegraph Improved seed includes expanding jiffy pellets. 12 cell jiffy propagator with a packet of Dahlia Dwarf Amore seed includes expanding jiffy pellets. 12 cell jiffy propagator with a packet of Freesia seed includes expanding jiffy pellets. 12 cell jiffy propagator with a packet of Garlic Chives seed includes expanding jiffy pellets. 12 cell jiffy propagator with a packet of Gypsophila seed includes expanding jiffy pellets.